I got the opportunity to take this picture on Saturday July 24, 2010. 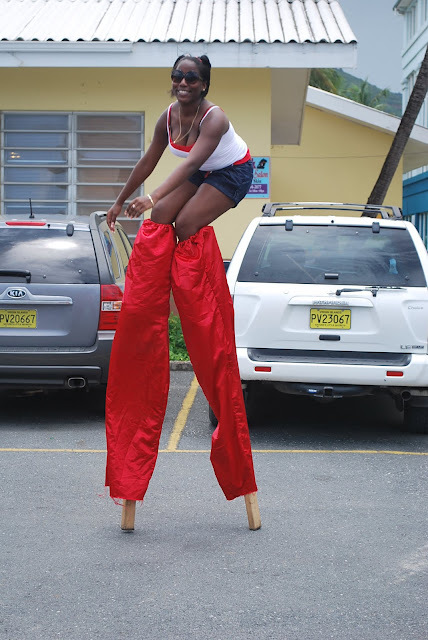 This young lady had just completed her session at the Annual BVI Kiddies Parade. People walking/dancing on sticks like this of various lengths are called Mokie Jumbies or Stick Walkers. Usually they are in costumes but as this young lady had completed her session, she had already taken off her costume. Don't worry she is not about to fall, I asked her to show me a few tricks. Unfortunately another one of her colleagues had a bad fall that same day and hit her head on the ground as she fell. She had to be taken to the hospital.